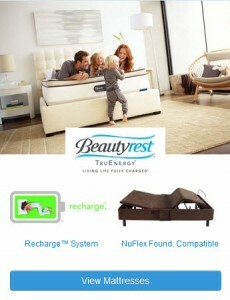 Beautyrest didn’t name the TruEnergy mattress lightly. It wasn’t an off-the-cuff creation. It’s not a gimmick. The Beautyrest TruEnergy mattress was engineered to live up to its name. It was made to provide an exceptional amount comfort, stability and relaxation, which can only yield one thing: energy. The Beautyrest TruEnergy mattress was designed with all the latest mattress technology in mind. It’s AirCool™ Memory Foam, Independent Support™ Technology and AirCool™ Design all come together to form an exceptional sleeping surface – one that will help you fall asleep sooner, stay asleep longer and wake up feeling more refreshed and relaxed than ever. TruEnergy ensures that it lives up to its name with the aforementioned features – something we like to call The Recharge™ Sleep System. It also comes with a 20 year limited warranty, which makes it an easy buying decision – completely safe and guilt-free. Call The Mattress Factory today for a free consultation and no-obligation quote. You can also stop in to see what we can offer you! Whatever you do, don’t miss the chance to sleep comfortably on the Beautyrest TruEnergy for many years to come!